Phil Jaber went on a quest 25 years ago to make a really great cup of coffee. And luckily for the coffee loving residents of Los Angeles, he was successful with the creation of his much revered Philz Coffee shops. You see Jaber wanted to create a blend of coffee that was flavorful, complex, rich, smooth, and low in acidity. His quest took him all over the world and after visiting thousands of coffee shops, Phil created over 30 unique blends that became the foundation of his fourteen coffee shops. Philz Coffee is a full service-coffee bar with two location in Los Angeles (Santa Monica and DTLA). This means they take care of everything from grinding your beans to mixing in your cream and sugar. Now I know it might be hard for the average micromanaging workaholic Angeleno to give up control of the blending of their coffee, but believe me going with the flow is worth it on this one! Philz Coffee focuses on making the best drip coffee. No lattes, cappuccinos, espressos, or pre-brews for them. Each cup is handcrafted one cup at a time by happy baristas dedicated to personalizing your experience. While at Philz I experienced the ultimate coffee jam with their Mojito Pour Over. And all I can say is: can life get any more delicious? It's creamy, minty, and full of smooth caffeination. Philz Coffee roasts their own coffee at their roasting plant in Oakland, California. There they specialize in customized blends that range from two to as many as seven different beans from around the world. And with an empire that extends to San Francisco and Washington DC (along with three more locations in LA: Hollywood, Pasadena, and Huntington Beach) you can see that the world agrees to give up a little micromanaging here and there! Here’s to Life Being Delicious and all your coffee being Mojito Pour Overs!!! 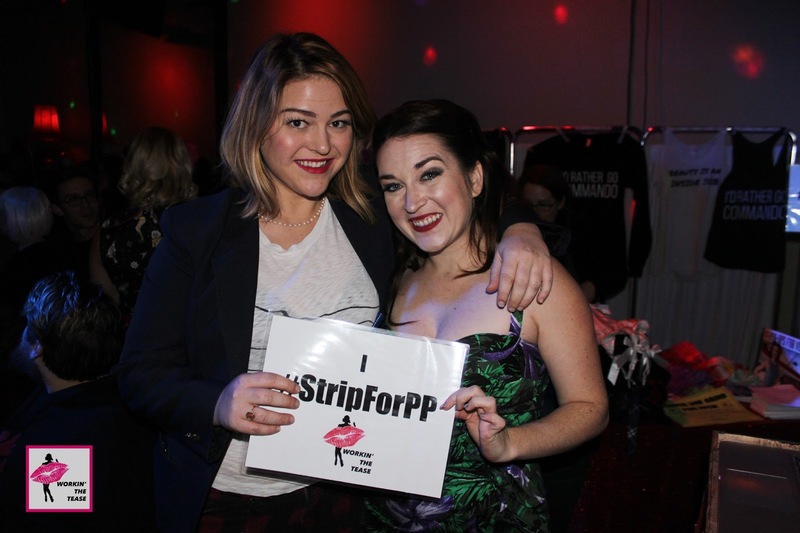 Another great tasty venue that Edible Skinny got to encounter while in Portland is the bohemian bistro Crush Bar, and also the venue for the fantastic #StripForPP event produced by Workin’ The Tease that I had a hand in producing…! With a slogan professing, “everybody is a little bit queer; everyone is welcome," Crush Bar is a gay owned and operated, restaurant/bar/event space that welcomes every one of every sexual association. Hosting a broad clientele of neighborhood friends (seriously for being a gay bar half the people in it were straight as an arrow...), burlesque fans (they do five, read it five, monthly shows in the back room), and travelers it’s the perfect place of a $6 cocktail (most definitely not LA prices!!!) along with a super vegetarian friendly late night snack menu. 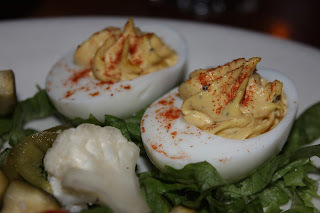 While there I feasted post show on their delightful Deviled Eggs with house-made picked vegetables (for once again the ridiculously inexpensive price of $5.00….). And I was in heaven with their vegetarian Bombay Poutine made with sweet potato fries with vegan, gluten-free curry gravy and Indian paneer cheese (another thing that would have been twice its $6 price tag in Los Angeles…). 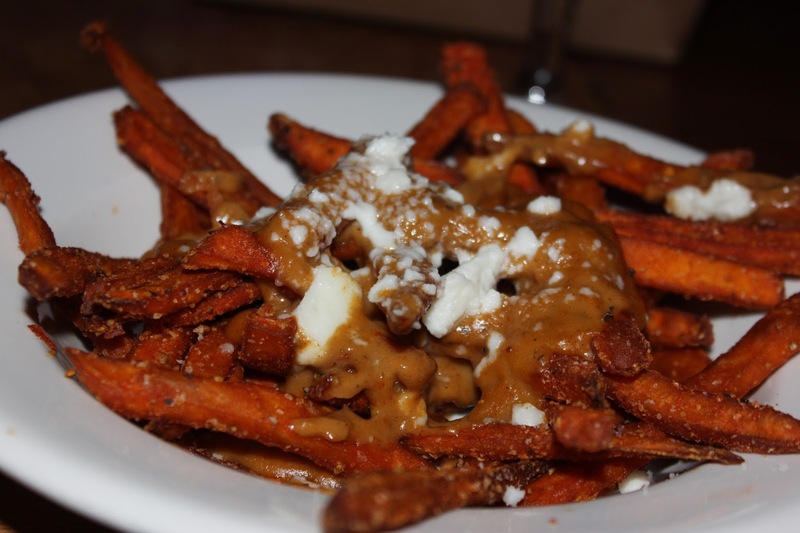 So if you’ve got a hankering for tasty cocktail concoctions, vegan poutine, and a location that doesn’t care if you’re gay or straight as long as you celebrate!, Crush Bar should be your Portland watering hole of choice! 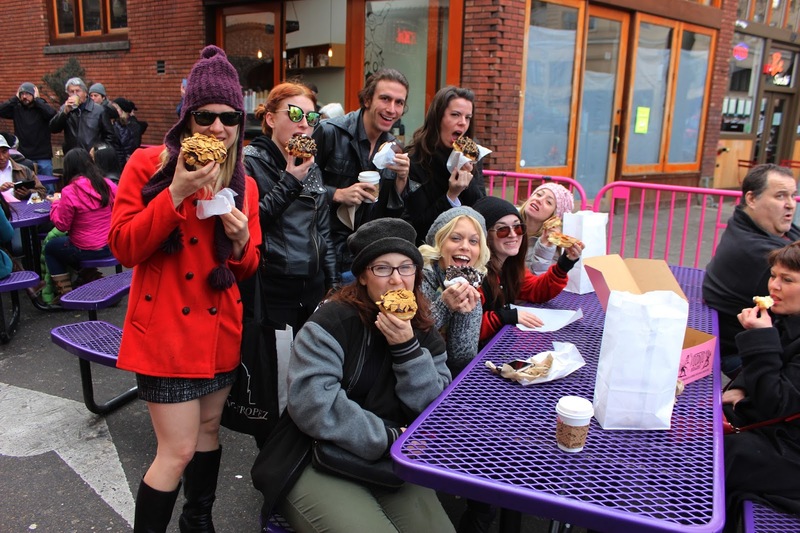 Via the Portland Sugar Coma with Voodoo Doughnuts!!! 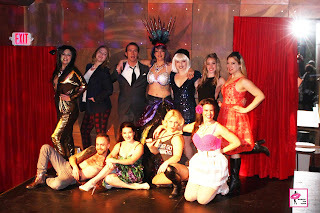 I was lucky enough to be in Portland and Seattle this weekend with Pin-Ups on Tour and Workin’ The Tease (the two burlesque brands that I produce and perform in) and while there I took a food tour of the Pacific Northwest. 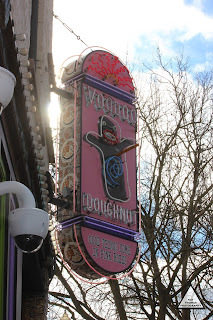 First up in Portland was (naturally) Voodoo Doughnuts. Voodoo Doughnuts is a cheeky sugar coma induced Portland institution. 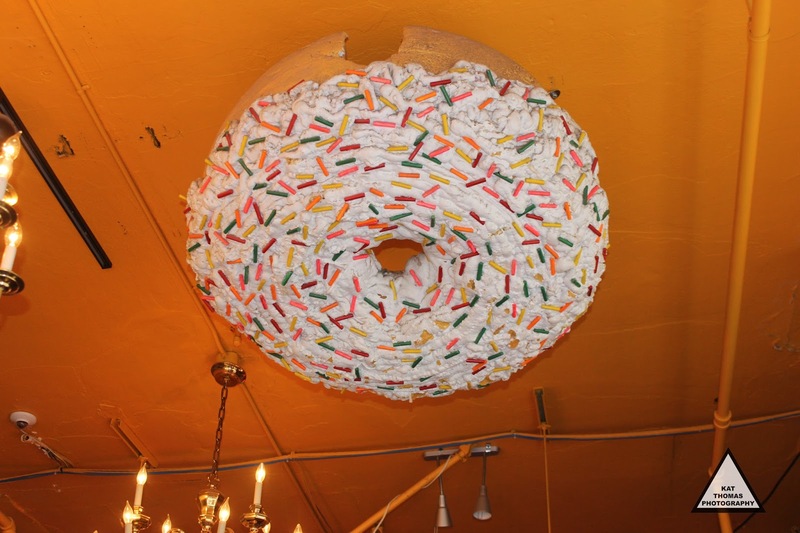 They’re known for unusual doughnut selection, eclectic décor, and iconic pink boxes featuring illustrations of voodoo priests. 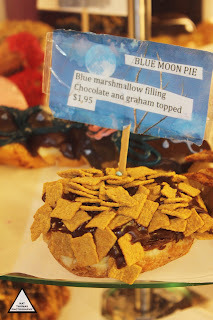 Voodoo Doughnuts has a myriad of unconventional ingredients including Cap’N Crunch, grape flavored Tang, M&M’s, Oreo cookies, and Marshmallows. (Two of their doughnuts, the NyQuil Glazed doughnut and the Vanilla Pepto Crushed Tums doughnut, are no longer available due to order of local health officials…). For those not looking for culinary thrill seeking, Voodoo also offers your more standard toppings such as berries, buttermilk, banana cream, sprinkles, chocolate, and sugar. 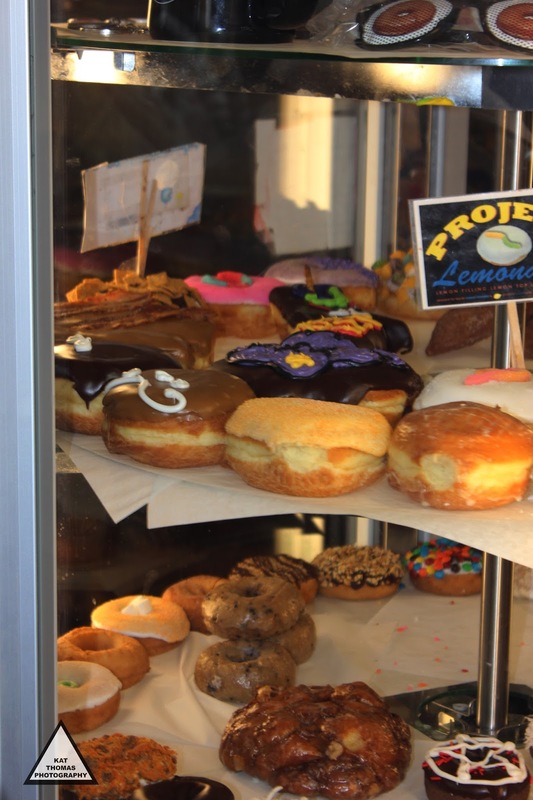 There are also a boatload of Vegan Doughnut options, apple fritters, and the famous Voodoo Doughnut Doll. The brain child of Kenneth “Cat Daddy” Pogson and Tres Shannon friends who wanted aspired to start a business together. So starting in 2003 their product of choice was doughnuts!!! The only problem was that neither Cat Daddy nor Tress had ever made a doughnut before. So they set out for sunny Los Angeles suburb of Pico Rivera, California where they met some doughnut masters and learned about dough from the ground up. When they returned to the Rose City they created a doughnut brand that the Los Angeles Times called an "international tourism attraction." 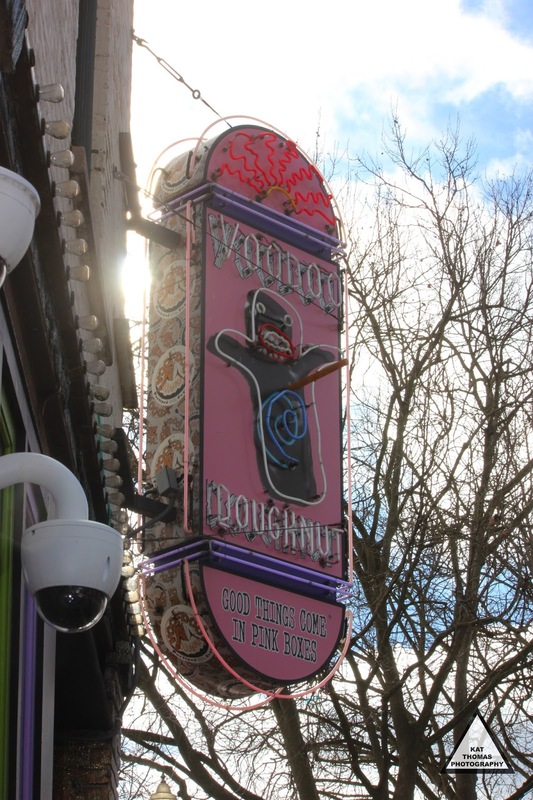 Voodoo Doughnuts has been featured on the Travel Channel's series Anthony Bourdain No Reservations, Man v. Food, Doughnut Paradise, and was the destination in the season finale of the 14th season of The Amazing Race. Unfortunately with a shelf life of 8-12 hours these doughnuts aren’t shippable so you have to go to one of Voodoo Doughnuts locations (5 in the US and 1 in Taipei, Taiwan) to grab this sugar high (and make sure to bring some green as they don’t take plastic)! Via the Portland sugar coma!! !